As CEO at Lead Generation and Management Solutions, these words are Jeff’s mantra…and mission for each of his clients.Jeff Smith is a seasoned business executive who has been a key player in more than 20 successful business start-ups in markets including entertainment, telecommunications, Internet, finance, software, online services, information publishing, business services, business consulting, customer satisfaction, reputation marketing, ROI tracking, business coaching and sports training. Throughout his career, he has re-invented himself in a variety of different markets by focusing on the key principles of success. 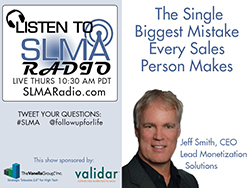 Smith’s primary focus today is on helping clients solve their lead monetization problems by implementing intelligent automated lead generation and follow up solutions. Like you, we all lead hectic lives with many distractions. Work. Home. Distractions from every corner of our daily lives. The result is we never have enough of our most precious resource…time. When we lack time, we often fail to focus on two of the most important aspects of our business success. Generating high quality leads that reach out to us - and following up on our leads in a professional and persistent manner until they are ready to buy, partner or whatever we consider success. As an author Jeff has written two best-selling books on Amazon. “Profitable Internet Marketing for Dental Practices - How to Get More New Customers Than Your Competition” and “Winning with Reputation: 12 Key Strategies to a Stellar Online Reputation.” Jeff is a guest that will entertain, educate and inspire your listeners to grow, overcome challenges and succeed.